We are approaching the end of Advent and embarking on the joyous season of Christmas. We have been preparing our hearts to welcome the birth of our Lord and Savior, Jesus Christ. The greatest miracle, the greatest joy, the greatest gift of all, is given to us from God, the gift of His son Jesus. Born into poverty to live amongst us, Jesus teaches us that only through Him will we know God, the Father of all creation. He is sent to save us from sin. It is through Jesus that we experience the immense love of God! I pray that as you read this you feel joyful anticipation for Christmas Eve. How could we feel anything else? Well, many of us have been distracted this year, as always, by the commercialism of this most Holy moment in time. Also, many of us are sadly distracted by physical pain and/or emotional distress. Some of us are overwhelmed by circumstances beyond our control and are having a difficult time feeling joy, and subsequently become even more distressed from the pressure to “be joyful”. Just remember that you are loved beyond the depths of your imagination, and on Christmas, God sends His perfect Love to you! I wanted to take this moment to highlight that Facing Our Immortality is expanding its mission. We are going to be ministering to people with cancer or serious illnesses at Father Woody’s Haven of Hope. This is a blessing. It is difficult to imagine that an individual may be struggling with a diagnosis like cancer and be in a condition of homelessness. If you have struggled with cancer pain or treatment side effects you know all too well how discomforting life can be. People who have no home must place inside their mindset a posture of incredible strength because they endure so much agony. They endure rejection, cold, heat, rain, snow, ice, hazards, hunger and incredible loneliness. Imagine adding cancer to that mix of circumstances. Prayer is essential for establishing a relationship with God, and in order to pray, one must have access to a quiet place where they can focus. This is probably very difficult to do if you have no home or place to call your own. Father Woody’s has a beautiful little chapel that radiates a sense of calm, you can feel the Lord’s presence. It is in Father Woody’s chapel that we will complete our prayers and discussions. The center itself provides critical resources for the homeless population and Margaret Pearson, Director of Operations, really understands the people in need. She has a loving and trusting relationship with them and is dedicated to making their lives better. Thank you Margaret for giving us this opportunity. Every human being deserves to live a dignified life. It is through this ministry that we pray for those in need to welcome Jesus into their hearts, to experience His never ending love and for them to begin to desire what God has in store for them. To learn more about Father Woody’s Haven of Hope, please link here. 15 When the angels went away from them to heaven, the shepherds said to one another, “Let us go, then, to Bethlehem to see this thing that has taken place, which the Lord has made known to us.” 16 So they went in haste and found Mary and Joseph, and the infant lying in the manger. 17 When they saw this, they made known the message that had been told them about this child. 18 All who heard it were amazed by what had been told them by the shepherds. 19 And Mary kept all these things, reflecting on them in her heart. 20 Then the shepherds returned, glorifying and praising God for all they had heard and seen, just as it had been told to them. Merry Christmas to you from all of us at Facing Our Immortality! 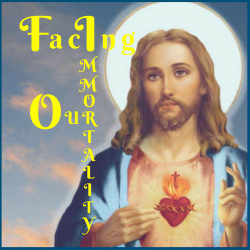 Facing Our Immortality Conference Information. I hope you can join us. If you don’t want to join online, you can call and then upload the documents from the website. If you are not able to join us at Our Lady of Lourdes Classical School, you can participate in our support group online. Uber Conference Facing Our Immortality Login and type in your name and email. You will be able to talk online and view the discussion documents. If you do not have access to your computer, you can call into Uber Conference at 720-735-7025. Please be sure to follow along the format. We look forward to talking with you soon. With great sorrow we report that Karen Pope has passed away, She went to her eternal home on October 29, 2018, leaving her family behind in Cheyenne, Wyoming. Please visit her obituary by linking here. We will be honoring her at our next group meeting, November 12, 2018, starting at 6:30 pm. Please see insert below. God rest the soul of our beloved and dear friend Karen Pope. We will greatly miss her, she was a true reflection of the loving light of our dear Father, Lord Jesus Christ. May God Grant Karen Eternal Rest. Amen.